CNers have asked about a donation box for Cloudy Nights over the years, so here you go. Donation is not required by any means, so please enjoy your stay. Last night, there was a clear sky not seen for many weeks due to bad weather. I looked up and think to myself "finally! Lots of stars, calm weather, not to cold not to windy, perfect, lets go back inside and rebuild that secondhand focuser." It's not the first time this has happened. I actually prefer to dismantle, repaint, polish,....... telescopes instead of going out and watch stars! I finished 2 telescopes and instead of using them, I am thinking about selling them cheaply to make room for a new project! Just curious if there are other people here like me, who like working on telescope more than observing. I am definitely an observer, I work on telescopes so they're more effective as instruments for observing..
To me the equipment is a means to an end. The lower the ratio of means to end, the better. That said, I enjoy the satisfaction of successful tinkering if it makes observing better. But to qualify as successful tinkering it must end in a jaw-dropping night of observing. I think it's wise for any long-time amateur to at least dabble in all three of these, just to get a sense of what they're about. And doing a spot of telescope tinkering is great simply to know that you're not totally at the mercy of manufacturers; making modifications is often surprisingly easy. Once I'm actually into any given piece of telescope tinkering, I invariably enjoy it. But it doesn't really give me all that much pleasure; I would be much happier if all telescopes did precisely what I want right off the shelf, with no need for tinkering. Believe it or not, there are those who love to design and build rather than look. And many of us who love to tinker around and observe! Amateur Astronomy has many sub-hobbies. Those that are arm-chair astronomers who are more into research and serious discussion. Double star observers, variable star observers, those who wish to be immortalized with their name attached to a new comet. Eclipse chasers and of course, the aforementioned telescope builders. So much to choose from and so much to do! Considering the weather (so bad) if I want to pretend to be an observer, tinkering is the only thing to keep me in the hobby! I guess I have a capitalist approach to tinkering. For example, I am very happy building a 5" apo. I just came in from giving the inside of the tube a second coat of black, out among the birds and trees. But the ultimate cause of the happiness is that once I finish, for about usd 600 in secondhand parts, wood, and glue, I will have a telescope and mount that would cost me over usd 2000 to buy, and more important, that I could never get through customs. If a new ES 127mm ED apo were for sale at the local hardware store for $600, I guarantee that I would feel like a fool sanding wood and getting my fingers all full of epoxy. That's human psychology for you. Edited by Araguaia, 19 March 2019 - 06:26 AM. Exactly. Tinker to improve, restore use and enjoy! I suspect you're in the minority, at least on CN, but tinkering is a good hobby. Do what you enjoy. With a nod to Ralph Meister, reading/learning/research is what I tend to do when the weather is bad for observing. That's when I get out the Burnhams, Webbs, Sue French, etc, books and brush up on some knowledge that I either didn't know or had forgotten! It also gives me lots of ideas for observing the next time I am able to get out under the stars. I clearly have two hobbies in Astronomy: the Equipment and the Observing. And I enjoy both of them! I find it quite enjoyable to take a neglected scope and bring it back to life (and better than ever at that), and I always like tuning/adjusting my equipment to get the most from it. That said, the Observing is the best part! I am chuckling at myself here.,First off I do very much enjoy being out observing.,I have dark skies here so no pack+drive. Not me; observing comes first, working on my scopes comes second, unless it's something that has to be taken care of. Concerning observing last night if you are into faint dso's; pretty big Moon most of the night no matter how clear. Now, if you're going to check out the pre dawn planets....enjoy. I say, to each his own in this hobby. We are not all just hunters and explorers of deep sky objects, planets, double stars, solar, lunar...….. we are also ATM builders and creators. We have a very special hobby as amateur astronomers, a hobby that is complex and fascinating. We keep watch over the universe--we are sentinels of the night skies while most people are focused on what's going on here on this third planet from the Sun. One thing seems to be true of anyone who uses a telescope: you end up being your own mechanic. Edited by Philler, 19 March 2019 - 09:27 AM. Let's not forget those that collimate and than look through the Ep just to see what a good job they have done or if they can make it even more perfect. Edited by InkDark, 19 March 2019 - 09:36 AM. 100% agree. Not a thing wrong if all one does is restore old equipment and never observes. Having "astronomy" as one's hobby covers lots and lots of different activities...even just reading. I'm the opposite. I have a hard time passing up a clear night and I struggle to keep up with basic maintenance like collimating & cleaning eyepieces. I don't think there's anything wrong with being one way or the other, most probably fall somewhere in between. I"m a professional photographer and I'm the same way with that. I rarely buy a piece of equipment unless I can make money with it or I'll be out shooting with it on a regular basis. I have colleagues that have closets full of equipment they don't need or use. For some people the gear is the thrill more then the act of using it. I'll make something it if it's going to be better than what's available commercially. I'm sure those that make their telescopes get great satisfaction when they're out observing with them. If I had more time I would consider doing that. I am solidly in the camp of tinkering being a means to achieving better observing. As others have said, I enjoy tinkering and ATMing (that's why I chose the path of the Dob) as long as it results in a better observing session. When I come in, settle down, and bask in the reverie of a wonderful observing session, that's when it all comes together and it all becomes worth it. I wanted nothing more than to get my eye to a eyepiece to observe what I had been reading about all these years. The means to that end was purchasing a telescope only to find out there was more to just looking through the tools of the trade. Now the tools have become a big part of the hobby along with all that goes with it, the end result still being getting my eye to the eyepiece. Edited by Crazyhorse1876, 19 March 2019 - 10:47 AM. As someone who has built a number of Dob's, my most recent being a 22", I can tell you that I consider myself an observer first, ATM second. Where I live in NE Ohio, the weather makes it very easy for me to be both. I usually have more time to tinker than observe though. I've most likely done it -- tinkered with astronomy-related projects instead of observing on a clear night; but far more often, if the sky is clear and dark, the project will be set aside to be continued at a different time. A tinkerer I've been ever since my first telescope -- making rings to hold a toy-store 'spy-glass' to use as a finder and making a wedge to convert a cheap alt-az mount into a cheap equatorial. Around the same time period, I bought or made a trade for a neighborhood kid's 3-inch Newtonian. I used the the primary mirror, the cardboard tube (that I used a saw to cut a large parabola out of), a cheap plastic camera (that I had 'carefully' broken the lens and surrounding plastic off of) and plenty of tape and cardboard to make my first astro-camera -- an off-axis reflecting camera. I successfully photographed Comet Bennett with it, so the year must have been 1970. A home-made, light-tight tube cover served as the camera's shutter. I've continued tinkering with astronomy stuff ever since -- making things, modifying things, etc. It's another part of the hobby that I gain pleasure and benefit from. 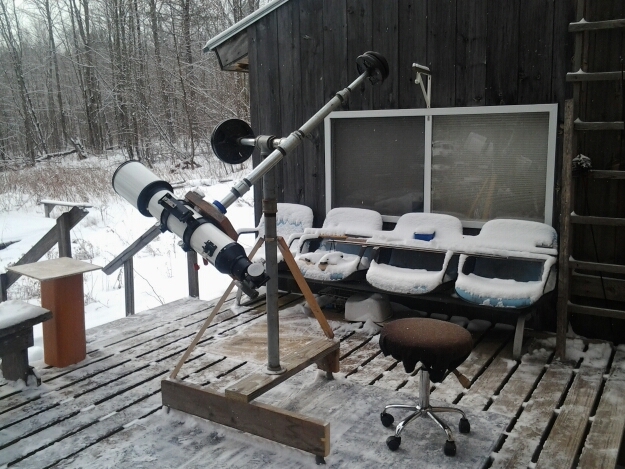 Tinkering, building and other DIY projects are not only a great part of the hobby of astronomy, but are how people like Rob Teeter got started, so we owe a debt of gratitude for the "engineering astronomers." As for me though...as Bones would say," **** Jim, I'm an observer not a mechanic!" I've both built and purchased scopes. I may do some small tinkering with my scope to fix a problem or optimize something, but in the final analysis, it's a means to an end - observing. If there is a night where conditions are favorable for observing, I'd say 85 % of the time I will be out. Even if a bright Moon is in the sky, I'll look at her. The exceptions are because of the odd scheduling conflict or an even more rare night of fatigue or illness. Over the decades, I've seen plenty of tweakers out there. Their goal is to build(or buy) and tweak to their heart's content. Actually looking through the scope is a side issue. Sometimes a far distant side issue. It's all about the gear. Most fall somewhere in-between while a few would rather just look and leave the mechanics to others far more capable. I'm a former builder so I can tweak when necessary, but only to the point of making my OBSERVING instrument better. My main goal is observing. There are all kinds in the passion (or hobby to some). If you go to the big events you'll see some that set up, tweak and never once look at anything, while others spend all their effort with minimal setup and everything is about looing through the eyepiece. Just like some are into astrophysics and the science side and could care less about telescopes. I wasn't sure if your health had been making it difficult to be posting or if we were just bumping about in different threads/forums, but in either case, from one TEC180 owner to another, happy to "see" you again! Do you stack images when you are using autoglider?